Working at a teaching school that already had existing links with LSBU through its hosting of teaching practice students, Peter Upchurch was keen to combine study with work and time with his young family. “My current role involves teaching music as an unqualified teacher and classroom support for KS4. I have been teaching music for the past five years to students from nursery to sixth form, including a year as maternity cover for the music lead, which meant that I was teaching full time,” he says. “As part of my KS4 and HLTA responsibilities, I help to run audio visual and technology support for the drama productions, special events and awards. I also assist in the maintenance and roll-out of ICT across the two sites, which involves setting up iPads and other devices to be used as augmentative and alternative communication methods. I have basically been doing the job for years and now want to have the stability of being employed to do what I love full-time and for the right pay. Unqualified teacher pay is only a little above what I am on as an HLTA. “I have several colleagues who have attended LSBU and they spoke highly of the staff and of the online support. I chose the work-based route of the BA in Education Studies because it meant I could do a degree while still working and raising my family. This was one of the main barriers to me going to university, as I have a young family that I need to support and so can’t simply give up my income in order to pursue a qualification. The full-time course involves one day each week of contact time, and my first two years were funded through my workplace, while my final year is being paid for via student finance. 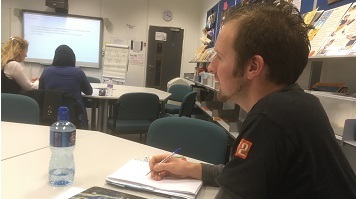 As part of the course Peter has had the opportunity to attend an alternative educational setting and so he chose to undertake his at the National Theatre’s (NT) education department. “During my time there I realised that education can be delivered to so many different demographics and is not just about teaching children and young adults. It also has so much to do with teaching people about themselves and how they relate to the world around them,” he reveals. Now in his final year, Peter is beginning to apply for paid teacher training in various schools close to where he lives, and is also looking at alternative places to work in education departments in theatres around London. “My hope for the future is to be able to support my family through gaining a job in education at a higher level to that I am at now. I worked my way up as far as I can go through college courses and training but to achieve the next level I needed a degree.